NATCHITOCHES – Each year, the Northwestern State University Demon Regiment recognizes alumni who have distinguished themselves in their military career, in their service to their communities and in their support of the ROTC program. 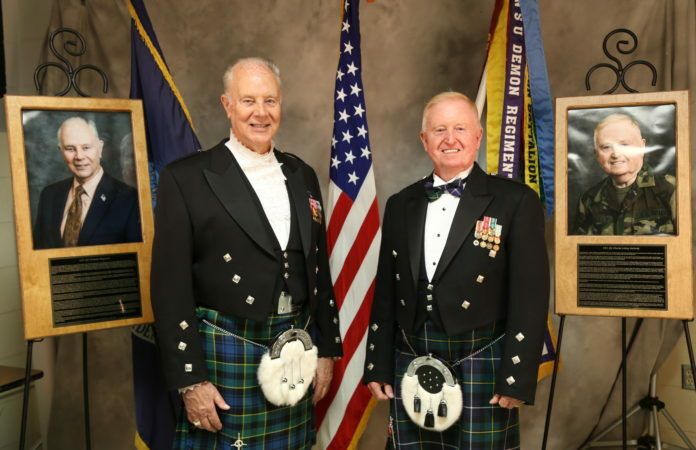 This year’s Demon Regiment Hall of Fame inductees are Lieutenant Colonel (Retired) Truman Maynard and Lieutenant Colonel (Retired) Charles L. “Sandy” McNeely. Maynard was commissioned a 2LT of Infantry on January 26, 1960, through the ROTC program of Northwestern State. He entered active duty March 20, 1960. Following unit assignments as an Infantry officer, he was selected to attend Aviation School at Fort Rucker, Alabama, where he graduated, first in his class and was designated an Army Aviator in November 1962. He was selected for training in the Army’s largest airplane, the CV-2B Caribou, and was sent to Vietnam in early 1963 as the first replacement pilot for 1st Aviation Company, the Army’s first fixed-wing tactical transport unit. In this role, he flew over 900 combat hours, delivering supplies into short landing strips in support of the U.S. Advisory effort and the Special Forces teams deployed throughout South Vietnam. At the end of 1963, the unit was ordered back to the U.S. to participate in the Army’s large-scale test of the Airmobility Concept in the newly-created11th Air Assault Division. The unit flew their Army aircraft from Vietnam to Fort Benning, across Europe and the North Atlantic. In 1966, Maynard was selected for a classified program (Project Crazy Cat), flying Lockheed P2 Neptune Patrol planes with the 1st Aviation Company (Radio Research). The unit self-deployed (flying across the Pacific) to Vietnam in June 1967 and brought a new dimension to the intelligence gathering capability of the 509th Radio Research Group. In addition to flying nearly 1,000 combat hours, he was the unit’s administrative and personnel officer. After returning to the U.S. and serving at Fort Hood, Texas, Maynard was selected to attend the U.S. Army Command and General Staff College, earning a position on the Commandant’s List. He was chosen to remain at CGSC as an author-instructor, teaching in the Department of Tactics. In 1973, Maynard attended helicopter transition training, again earning the top-graduate’s position, and went to the Second Infantry Division in Korea. Serving for a time as the Division’s Aviation Staff Officer, he then commanded a helicopter company in the most forward-deployed combat division of the Army. Returning to the U.S., he was assigned to the office of the Project Manager for Training Devices. He managed the development and fielding of the Synthetic Flight Training System, a family of high fidelity flight simulators for Army helicopters, then took over management of the Multiple Integrated Laser Engagement System (MILES), perhaps the most important advancement, ever, in bringing reality to Army force–on-force combat training. In 2006, Maynard returned to his alma mater and took a leading role in the establishment of an ROTC Alumni organization, The Demon Regiment. McNeely was commissioned a 2nd Lieutenant, U.S. Army Military Police Corps, upon graduating from Northwestern State in May 1964. Upon completion of Military Police Officer Basic Course at Fort Gordon, Georgia, in August 1964, he was assigned as the Operations/Administrative Officer, 52nd Criminal Investigation Detachment (CID), Mannheim, Germany. The following year, he transferred to the 537th MP Company, also in Mannheim, to serve as a Platoon Leader. Upon promotion to Captain in March 1967, he assumed duties as Mannheim area Provost Marshal. In September 1967, McNeely arrived in Qui Nhon, Vietnam, and assumed duties as Battalion Operations and Intelligence Officer (S-2/3) for the 93rd MP Battalion. He served in that capacity his entire tour of duty. His next assignment came in September 1968 as the Commander of 111th MP Company at Fort McClellan, Alabama. The following year, he relocated back to Fort Gordon to attend the MP Officer Advance Course, where, upon graduation in May 1970, he was selected to remain at the US Army MP School as a Classroom Instructor for the Civil Disturbance Orientation Course (CDOC). McNeely returned to Vietnam in early September 1970 and assumed command of A Company, 504th MP Battalion, as well the duties as area Provost Marshall of the Phu Bai area in I Corps. The following March, he was reassigned to DaNang to serve as Operations Officer (S-3) of the 504th MP Battalion. He returned to the United States in September 1971, again to Fort Gordon, and resumed duties as a classroom instructor at the U.S. Army MP School. He separated from active duty in April 1972, remaining in the Individual Ready Reserve (Unassigned), St. Louis, Missouri, until September 1975. McNeely became active in the U.S. Army Reserve in September 1975 when he received an assignment as Administrative Officer for the 1st Region Criminal Investigation Division (CID), Fort Meade, MD, until August 1978. LTC (R) McNeely was then assigned as Assistant Operations Officer, FORSCOM Headquarters, Provost Marshal Office, Fort McPherson, Georgia. He held this position until October 1985. He then transferred to the 4158th U.S. Army Reserve Forces School, in Shreveport, where he served as an Instructor of Command and General Staff College Courses at Fort Polk until his retirement in June 1992. McNeely was the first Adjutant of the NSU Demon Regiment. He was instrumental in developing the ROTC alumni database and creating the Assistant Adjutant Program for each graduating class. He continues to support events held by the NDR and ROTC Program. For information about the nomination process, or to nominate a member to the NDR Hall of Fame, contact the Military Science Department at (318) 357-5157. Nomination packets must be received by December 15, 2017, to be considered for induction during the Military Ball, which will be held on March 24, 2018.